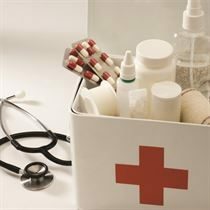 The presence of a fully stocked first aid kit is a health and safety requirement in most workplaces. In a hospital or healthcare setting, it is even more important. First aid kits usually have everything you need to treat minor injuries and usually include different kinds of plasters, bandages and wipes among other items. Our first aid kits comply with workplace regulations and we offer refill packs to help keep your first aid kits topped up and compliant.